Tom Colley started his trip off right with 3 nice roosters his first day between 25-40 pounds including this one with an assist from our Captain Archangel. Right off the rocks near Punta Arenas. All fish were released. 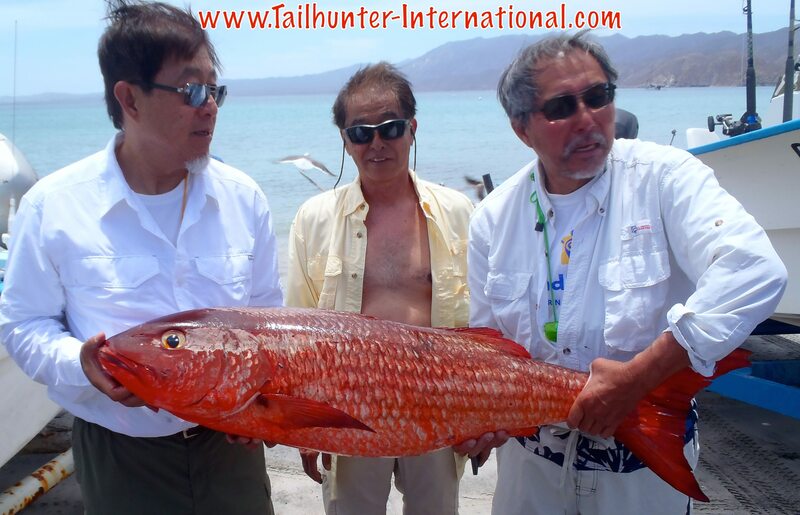 Brothers John (left) and Pat Lee (right) hold up one of our larger pargo liso (mullet snapper) that John caught fishing with our Tailhunter fleet from Las Arenas/ Muertos. The brothers are from the Sacramento area and fished 2 days, but got caught in the bad winds on their 3rd day that plagued us all week. 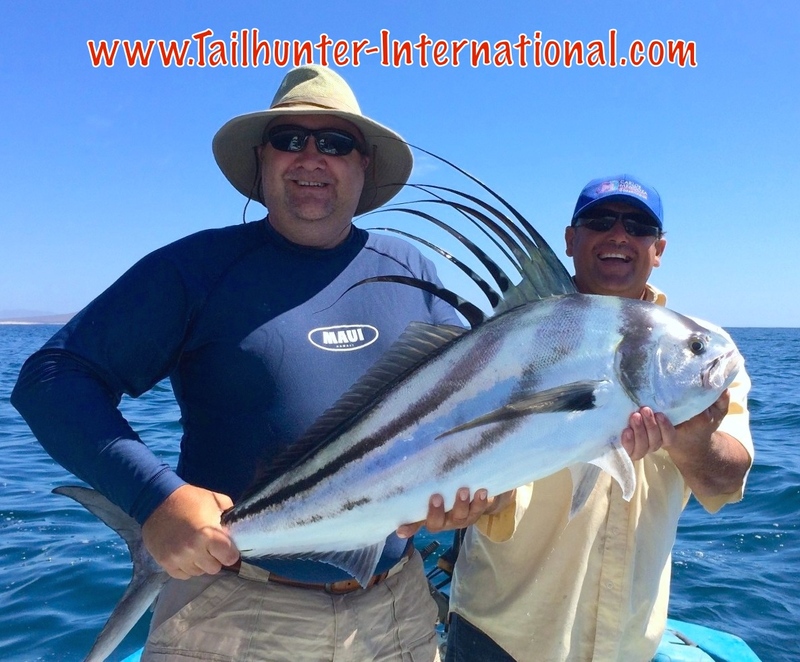 Formerly from England, but now living in Seattle, Nigel Waterton with our Tailhunter Captain Armando hoist a nice roosterfish that Nigel caught and released not far from the Arenas lighthouse. 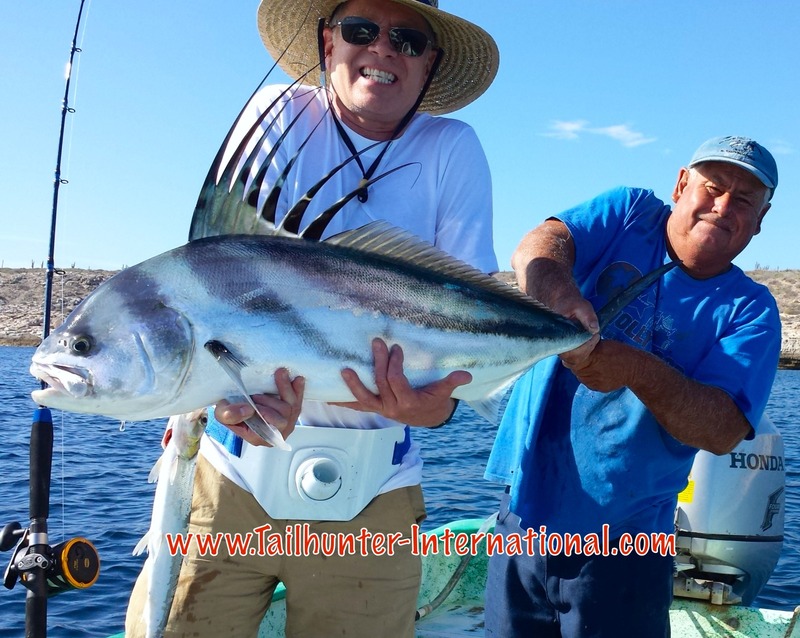 Roosterfish saved us many days this past week which was great since these exotic fish are quite a trophy. One of our larger dorado of the young season and our good amigo, Kevin Beehn, who used to live here in La Paz, but now is in Brentwood CA. Kevin’s holding the nice bull on the beach at Balandra. This is a HAWG of a barred pargo! 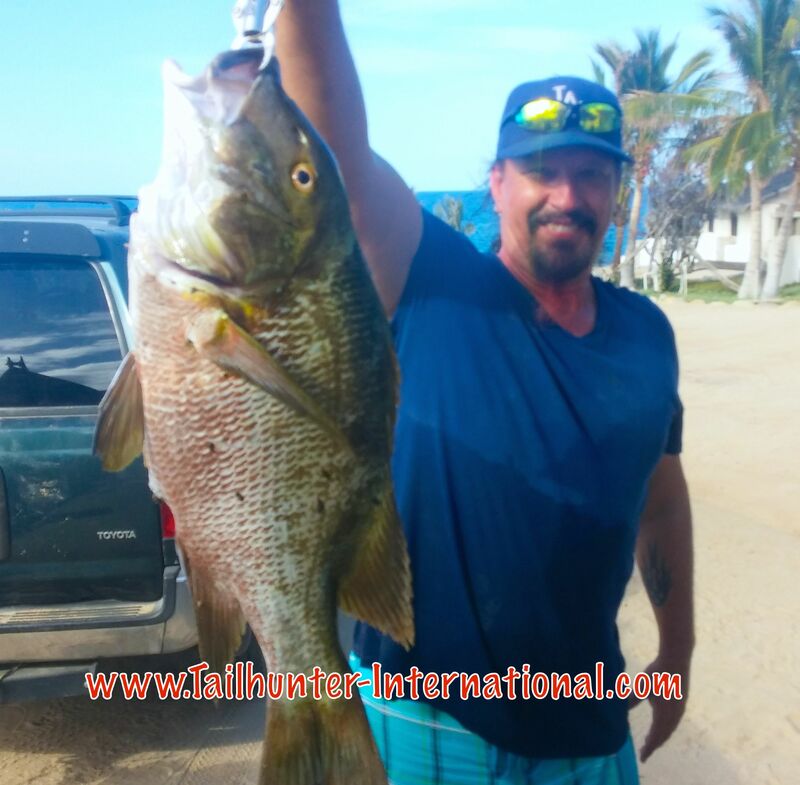 Jeff Page caught this fishing with amigo, Larry Cornwall outside of Bahia de los Muertos. 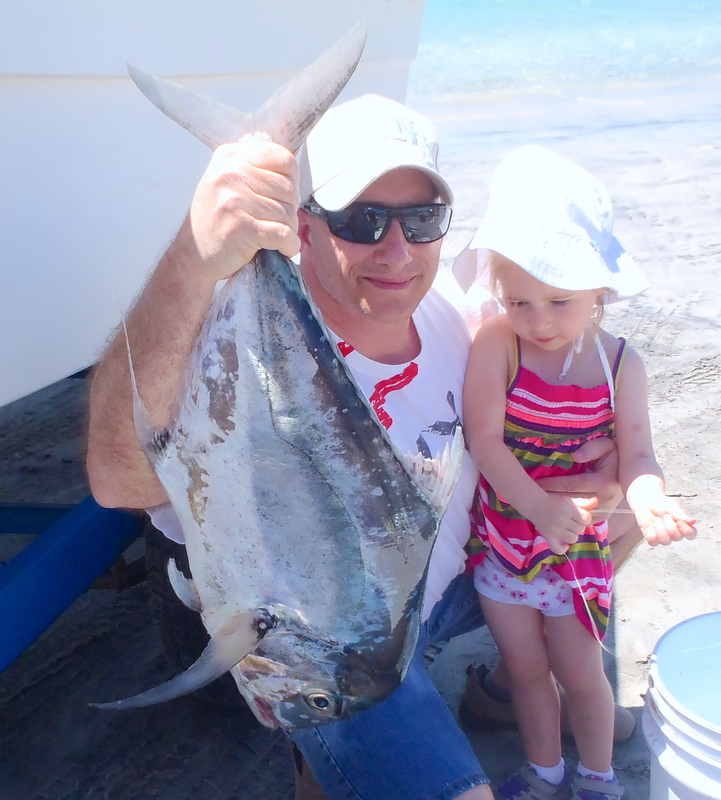 Little Renae Minner just 2 years-old was a game as any veteran angler to go fishing even with the rough waters and she and her dad got this nice pompano. They came from Nashville, Tennessee. It wasn’t the best of weeks for us. Actually, it might have been one of the worst weeks of the young season. Just want to be honest. Dang, it was tough. Just when I thought we were headed into warm early summer weather and conditions, the fish gods put me back in my place. Normally, a full moon is no big thing, but coupled with the some incredible big tide swings; several days of almost ferocious whipping winds and big waves and swell generated by a storm in the Pacific…well…let’s say it could have been better. As I said, normally, the big moon isn’t a great concern. However, early in the week, then several times mid-week, we had a combination of strong gusty winds from all directions. On top of that, there was a huge storm in the Pacific that generated giant waves on the Pacific coast as well. Those waves produced massive surf (surfers loved it) but were so big, there were stories of cruise ships in S. California that were unable to dock. Down in Cabo San Lucas, the surge was so big that many boats didn’t go out. Those waves didn’t hit us in La Paz, but the surge and peripheral wind generated waves and swell didn’t help us. It surely had an effect on fishing just when I thought we were done with wintery weather. We have a friend here in La Paz who keeps weather logs and he told us, “this is one of the coldest April-May records I’ve ever recorded.” Indeed, although the days were warm and sunny, the evenings and mornings were downright chilly. Clients were wearing sweatshirts. Captains were wearing their full slickers and down jackets and vest out on the water! There were even a few little rain squalls here and there. All-in-all a tough week for everyone. A rough time for anglers. Several of outfitters in town who specialize in flyfishing were not even able to get out on the water for 3 of the days this week because of the high winds and seas. We had one day where our guys (fishing conventionally) waited on the beach for things to calm down and still, had to come back to La Paz when it was clear the water was’t going to cooperate. Except for that one day, we did get boats out everyday with varying degrees of success. But not very spectacular. On the days we were out, there were some good days and some not-so-good-days. When the wind blows and the waters crash, it’s hard to get bait so that didn’t help. Still, some nice catches of rooster fish (10-40 pounds), pargo, cabrilla, jack crevalle, small dorado, and bonito and a wahoo or two. But not especially great and every day was different. Really scratchy fishing overall. Since most of the winds came from the south and west, and we fish north of town, the La Paz fishing tended to be better with a little more protection from the elements. But still, everything is connected and anglers and skippers still had to contend with choppier-than-normal waters and winds. Again, the effect on the fishing was telling. 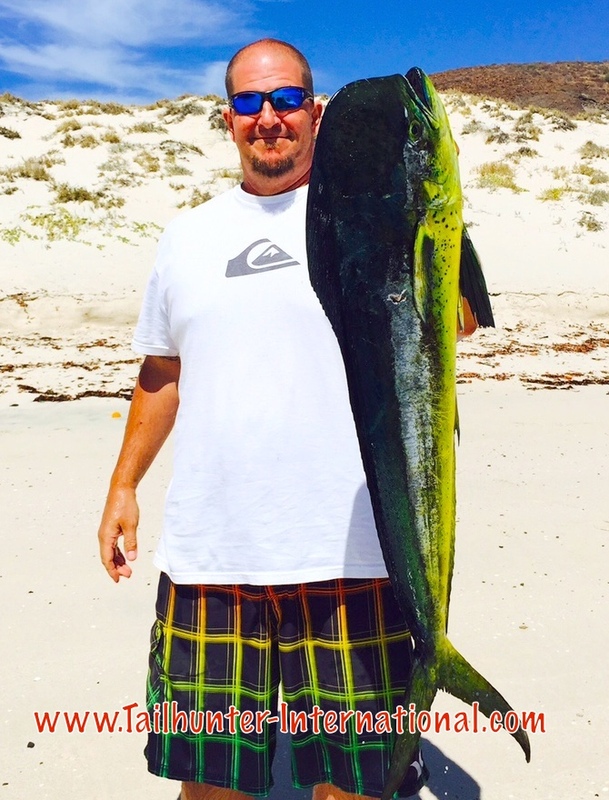 Some dorado were caught and a few marlin were baited but dropped. Most of the action was inshore for pargo, cabrilla and jacks. Lots of fish lost in the rocks. So, it was decent for “fishing”, but not always good “catching.” Some very big fish, including some big amberjack were lost to the rocks. Hopefully, by the time you’re reading this, things will have gotten back to normal! That’s our story! Happy Mom’s Day to everyone and God bless all you moms!